About two-thirds of glaciers' loss witnessed in recent decades can be attributed to human activities. According to a study, only 25 per cent (±35 per cent) of the global glacier mass loss between 1851 and 2010 was due to human-related activities. But the figure rose to 69 per cent (±24 per cent) between 1991 and 2010. “The ongoing global glacier retreat is affecting human societies by causing sea-level rise, changing seasonal water availability, and increasing geohazards,” says the research published online in Science. 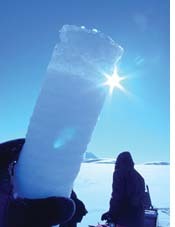 Computer simulations were used in the study which analysed all glaciers in the world outside Antarctica. Glaciers take decades or even longer to respond to climate change and the jump from 25 per cent to 69 per cent in two decades is alarming, say experts.